"In a signal that major reform may be on the horizon, the Vatican announced today that Pope Francis has formed a group of eight cardinals from around the world to “advise him on the government of the universal church” and “to study a project of revision” of a document from John Paul II on the Roman Curia. At first blush, all these cardinals seem like strong personalities. Several have voiced criticisms over the years about various aspects of Vatican operations, while two, Cardinal Sean O'Malley of Boston and Cardinal Reinhard Marx of Munich, Germany, have played key roles in the church's response to the child sexual abuse crisis. The group’s first meeting is set for Oct. 1-3, and meanwhile, according to the Vatican statement, the pope will be in regular contact with the cardinals individually. The brief item in the Vatican’s daily press bulletin did not explain how these cardinals were chosen, or how long they will serve in these roles. Strikingly, there was only one member of the Roman Curia among the eight cardinals tapped to assist the pope. The rest come from various parts of the world, with at least one representing each continent..."
"Father Alfie Kelly was born in Buenos Aires to Juan Kelly and Elisa Casey, the youngest of seven children. He joined the Pallottines at a young age and studied in Buenos Aires and Rome before his ordination in 1957. At the time of his murder he was the pastor at St. Patrick’s, responsible for student formation and rector to one of the diocesan catechetical seminaries. Notably, Kelly was the spiritual director to the young man who was to become the Cardinal Archbishop of Buenos Aires, Jorge Bergoglio, now Pope Francis I.
Kevin O’Neill SAC, described his life and work “He specialized in spiritual direction, retreats, Catechetics and in youth work which was his principal apostolate. The best word to describe his character is ‘solid’." Father Alfie Leaden was born in Buenos Aires but his parents, Patricio Leaden and Brigida Ussher were of Irish descent. One of eight brothers and sisters, he was educated educated by the Irish Mercy Sisters and later by the Pallottine Fathers. He went on to study philosophy at the Pallottine seminary in Thurles, County Tipperary, and continued his studies in Rome, according to Pallottines.ie. Ordained into the priesthood in 1942 he worked in many Pallottine communities in Argentina. spell of humility, simplicity and spontaneity. that he looked like Pope Paul VI, then I felt he looked like Pius XI. was that of John Paul I, the smiling Pope. on the authoritarian model of my boyhood. O.P., and Monsignor John Greehy, the late parish priest of Terenure. as hotels I knew were full. 1. John Cooney, ‘A Pilgrimage, a Council and a Synod’, Doctrine & Life, November 2012.
police confiscated her banner proclaiming ‘Women Priests are here’. for six nights accommodation and was given the key to apartment 229. Palace, where history would unfold. destinations. To my dismay, it proved impossible to flag-down a taxi. doubling the time it took to get to my casa. up the Curia; otherwise it was dead in the water. > Monday March 11 was the last day of the pre-conclave discussions. > Code of Canon Law. > Vincent Healy, a victim of a Spiritan cleric and now a victims’ crusader. > too young at 53. I ruled out an American pope. > of Cardinal Desmond Connell. > level off church governance. > accountability to the faithful. > Knape, fxBear, Yellow Springs, Ohio, 2012. > not the Church, the Bride of the Lord’. > one word I had said! > WILL WE HAVE A VATICAN III ? > Cardinal Brady and the Archbishop of Dublin, Diarmuid Martin. > peaks will look less imperial and more collegial." On Wed. April 10, 2013, Resurrection Community in Cincinnati ( approximately 75-100} Catholics meet monthly)celebrated an Easter Liturgy. and Deacon Rosemarie Smead who will be ordained a priest in Louisville on April 27, 2013. This community will celebrate their 3rd year anniversary next month. On Saturday, April 27, 2013 at 1p.m. Dr. Rosemarie Smead of Bedford, Kentucky will be ordained a priest in the Association of Roman Catholic Women Priests. The presiding bishop will be Bridget Mary Meehan of Falls Church, Virginia and Sarasota, Florida. The ceremony will take place at St. Andrew’s Church of Christ, 2608 Browns Lane, Louisville, Kentucky 40220. Media are invited to a pre-ordination conference on Saturday, April 27, at 11:30 a.m. at the church with the candidate and Bridget Mary Meehan. Call Janice (859-684-4247) to schedule an interview. 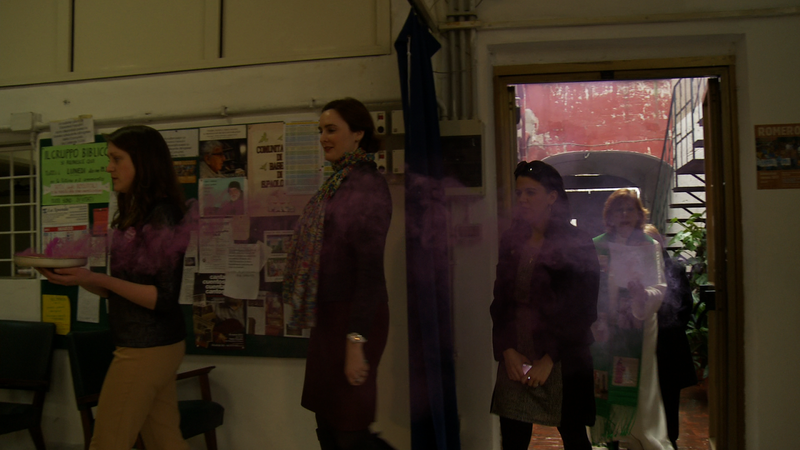 Respectful filming/photo-taking during the ceremony is acceptable. The ordinand is theologically prepared and has many years of experience in ministry. Dr. Rosemarie Smead began her spiritual journey as a Discalced Carmelite nun. She later earned a BA in Theology from Marquette University, a Masters in Psychometrics, and a Doctorate in Counseling Psychology. She worked for many years with delinquent teens and others in need of counseling. Presently, she leads a local worship community and also works as a couples and family therapist. The author of six books and videos on working with youth, Dr. Smead is retired from a teaching career of 26 years at Indiana University where she was honored for her “Distinguished Teaching and Service”. “I want to bring inclusive communities to the Louisville area where all are welcome with a special outreach to young people to develop their full potential,” she said. The church is at a crossroads with a new pope and women priests. This paradigm represents a holy shakeup and is pregnant with potential for renewal and change. Pope Francis’s simplicity and solidarity with the poor and marginalized is the Good News that Catholics have been waiting for. Now is the time to embrace women. Since two-thirds of the world’s poor are women, justice and equality must be top priorities for our church. Our world and church can no longer function without the voices of women’s lived experience. 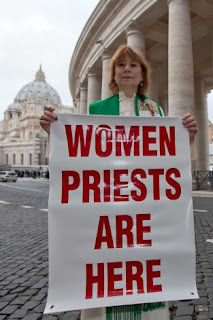 Women priests are visible reminders that all women are images of God. The Association of Roman Catholic Women Priests calls on Francis to embrace the full equality of women, including women priests. Women priests are now on the ground, living and serving in inclusive communities and welcoming all to receive the sacraments. On March 13, five hours before the new pope was elected, a woman priest celebrated Mass in Rome. Women priests are answering the call and our movement is growing. According to a recent CBS Gallup Poll, over 70% of Catholics in the U.S. support women priests. There is no shortage of vocations as women are now saying “Yes” to this call and are being ordained. Now we have the first historic ordination in Louisville as Dr. Rosemarie Smead is ordained. In May our first woman priest will be ordained in Cincinnati. "Roman Adventures" The Inside Story of Janice Sevre-Duszynska, Woman Priest's Arrival at St. Peter's/Vatican-Close Encounter with Police! I moved quickly after getting through customs. 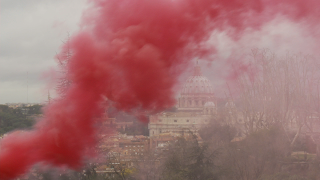 A new pope would soonbe elected in an unjust and patriarchal manner, not by the people of God. 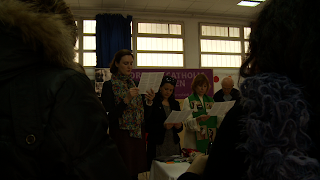 Now was the time for women’s voices to be heard and our banner for women priests displayed. Now was the time for a woman priest to lead a Eucharist celebration with the people of God. 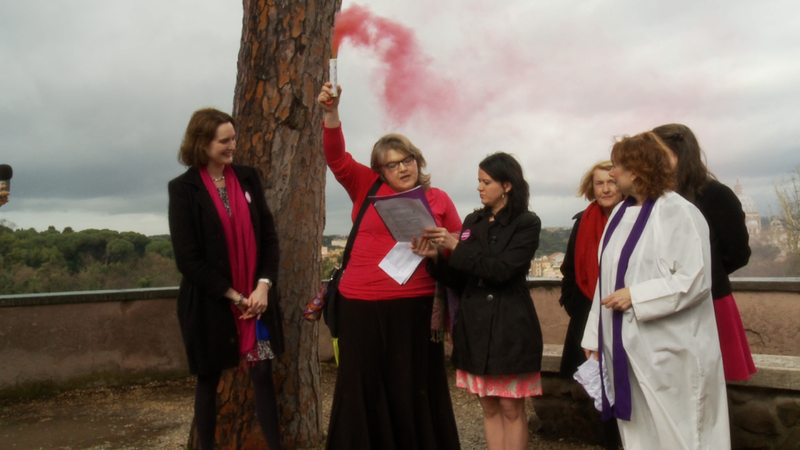 Our women priest community and supporters sent me to Rome. I headed toward the baggage area with my computer bag and carry-on. 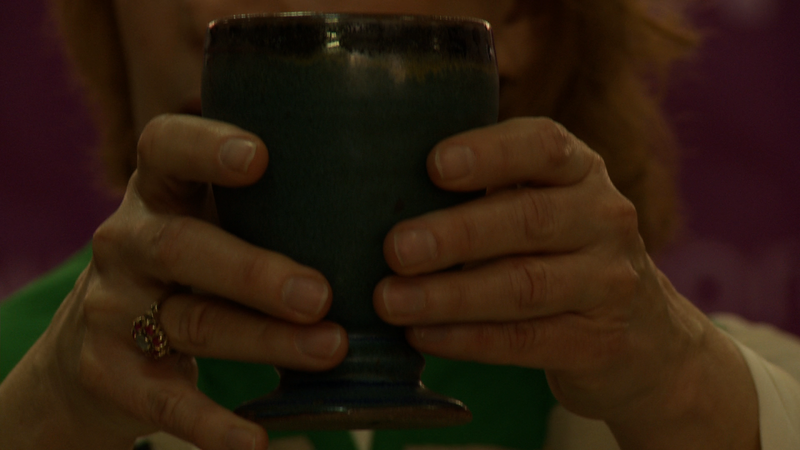 As per Bridget Mary’s cautionary suggestion, which I heeded, they were filled with my old, “witnessing-to-the-bishops” alb, red cincture, pottery paten and chalice, purificator. stole and 70 copies of our “Liturgy to Celebrate Justice, Partnership and Equality for Women in Church and Society.” If my luggage didn’t show up, I was still prepared to celebrate Mass. To save time and effort, Donna had suggested that I take a taxi and not the train into the city. There were media waiting for a woman priest. I yanked my luggage from the conveyor belt and asked a police officer where I could catch a taxi. Seconds later, Giuseppe introduced himself and led the way to his car. I gave him the address of the convent guesthouse: S. Emilia de Vialar. Along the way, I noticed the cloud coverage yet also here and there a peek-a-boo sun. “Rain and cold for the next week,” he said, as he negotiated our way through the tight and boisterous Italian streets. cabinets and sculptures which lined the hall. Once inside my room, I knew I had to hurry. I opened my carry-ons and piece of luggage and removed their contents. Then I grabbed shampoo, soap, washcloth to shower and wash my hair. Outside the bathroom, I set my hair in old-fashioned rollers and dressed in the undergarments to wear my homemade alb. In a plastic bag I would carry my stole, umbrella and our new banner: WOMEN PRIESTS ARE HERE. After I dried my hair, combed it out, prepared myself to leave, I put on the green rain and shine coat from my sister which she suggested I wear as it covered most of my alb. Before doing so, I used the red cincture from my old “bishops” alb to hold up this one, which was my ordination alb. I called the media to let them know I was on my way. Inside the office, I dropped off my key and the sisters told me that I should leave my passport in the room or it could be stolen. Although I had a belt around my waist under my alb, I returned my passport to the room…as I tried to honor their wisdom. It was raining outside as I made a right turn and followed the wall of St. Peter’s,i-phone in hand, communicating with the press who I needed to find. I did not go in direct proximity of St. Peter’s where Roy and Erin and Miriam had been arrested in October 2011. I saw the Italian police gathered there. Instead I skirted around here and there, attempting to avoid them. Finally, I reached my destination and the AP folks were there to greet me. They whisked me up to a media loft, asked me many questions, and took photos. I must admit I felt dizzy on this soap box they had me stand on with the Vatican in the background. I had eaten very little and had very little rest. Nevertheless, it all worked out. 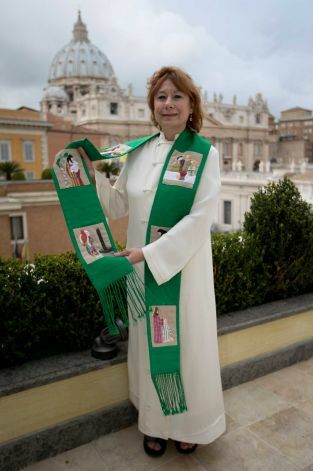 After the photo shoot, we walked toward the columns of St. Peter’s with my banner: WOMEN PRIESTS ARE HERE. I told them it was not my intention to be arrested and I would not go into St. Peter’s Square (I would be prevented from doing so as I had been dressed as a priest in November 2011 with Roy and Erin. The Vatican did not want to touch me representing women priests. Furthermore, a main focus of my Roman witness was to celebrate an inclusive Eucharist). I walked with the AP folks down to the left column in my priestly garb. Folks saw me, including a group being led by a male priest who looked at me with disdain. The press snapped pictures. In front of St. Peter’s Square I saw a woman talking to the Italian police. Perhaps she had seen my alb from beneath my sister’s rain’n’shine coat, I thought. Soon an older Italian policeman walked toward me. He was a man around my age (early 60s), dressed in his police uniform. 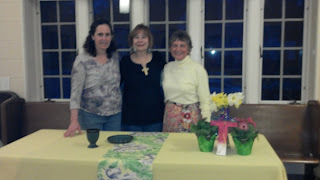 Other folks snapped photos and I talked with them about our movement for Gospel equality for women in our Church. They were on board. A Spanish radio reporter asked if he could interview me . I said, “yes.” Right there he happily asked me questions about our movement. After, I gave him a copy of the “Pink Smoke” dvd which was in Spanish, too, Roy’s booklet and our ARCWP brochure as well as my card. Weeks later I saw that his interview had played on Spanish radio. Then the Roman policeman returned with his plainclothes policeman who knew more English than he did. I was to produce my passport. “Where are you staying?” the policeman asked. I reached into by bag and gave him the address of our S. Emilia de Vialar convent guesthouse. Now, I must stay that as an activist in the peace movement as well as for women priests, I thought quickly of my options. What is best here? Should I do a sit-in as I’ve done before? Maybe I could go limp and refuse to go into the police squad. All of these questions presented themselves to me. However, I thought, let them take me and reveal the shallowness of their faith, behavior and trust in the Spirit. So, I got into the squad car not knowing where they would take me. He acquiesced and I went inside. I looked into his eyes which had softness at their base but were following orders. “Here’s my card,” I answered, as I handed him the simple white and black card with the angel and her trumpet announcing my long-awaited priesthood. Then I gave him our ARCWP brochure. He skimmed over it quickly and reported back to his source on the phone. I answered him. “I’m the only woman priest here and I’ll be staying a week.” It appeared a great relief to his soul as he communicated my message to the Captain by phone. When I produced my passport, he was on the phone again with a Captain, going over my passport, etc. I saw that his helper, who was dressed in plain clothes and who could speak English, was smoking a cigarette. We shot the breeze and he told me he had no objections to women priests. It was just two people of God trying to communicate and find common ground. I liked him. Finally, when the older officer got the “okay” from his superior, I thanked him for being kind to me, shook his hand, and gently kissed him on the cheek. He dropped all pretenses and was his natural and God-given kind and gentle self. We shook hands. I thanked the younger officer who spoke English and they drove away. I returned to the convent and was not thrown out even though there were plenty of windows open while the squad car was outside. I spent my time organizing the contents of my luggage, calling Bridget Mary and quietly, reflectively praying. Liturgy in Sedona, AZ, Sunday, naming the Inclusive Catholic Community pastored by RCWP Ree Hudson, Saint Kateri Tekakwitha. Fr. Gabriele, Vatican Chief Exorcist, States that He Expels 300 Demons a Year from the Vatican- No Kidding!/ Secrets of the Vatican Exposes! Baudelaire once said that "the greatest trick the devil ever pulled was convincing the world he doesn't exist. " But in modern-day Vatican City, the devil is considered alive and well. The late Pope John Paul II personally performed three exorcisms during his reign, and Pope Benedict XVI expanded the ranks of Catholic-sponsored exorcists throughout the world. In fact, Father Gabriele Amorth, the Church's chief exorcist, claims to expel more than 300 demons a year from the confines of his Vatican office, and there are some 350 exorcists operating on behalf of the Catholic Church in Italy alone. Amorth also teaches bishops how to tell the difference between satanic possession and psychiatric illness, noting that those who suffer from the former seem to be particularly repulsed by the sight of holy water and the cross." "As observers throughout the church wait to see how Pope Francis will handle issues of substance, some are looking particularly at what openness he’ll show to the participation of women in church leadership. Just five hours before Cardinal Jorge Mario Bergoglio’s election to the papacy March 13, women from the U.S., Canada, Australia and Europe gathered in a downtown Roman schoolroom for the celebration of Mass by the Rev. Janice Sevre-Duszynska, an ordained minister of the Association of Roman Catholic Women Priests. Both demonstrations were small in numbers compared to the hundreds of thousands who thronged St. Peter’s Square to welcome the newly elected 76-year-old Francis. But the demonstrations drew considerable media attention from a number of international news agencies. Sevre-Duszynska’s Mass was held at the headquarters of the Comunità Cristiana di Base di San Paolo, a spartan facility that has long been the home of a Roman Christian base community first housed at the ornate Basilica of St. Paul Outside the Walls. Using a school desk as an altar, Sevre-Duszynska gave voice to her belief that women will be given official sanction to preside at altars worldwide, including those at St. Peter’s Basilica in the Vatican. “The Vatican gives flowers to women, but what women really want is full equality,” Sevre-Duszynska said, referring to Vatican officials giving flowers to women staff members on March 8, International Women’s Day. “Women priests are here,” she said, presiding in a white chasuble and multicolored stole. “Are the men of the Vatican so un-free that they choose to ignore the movement of the spirit of the people of God?” she asked. “How can the church speak about justice when the hierarchy does not practice what it preaches? The March 12 vigil at Rome’s Piazza Garibaldi was held in pelting rain interspersed with thunder and lightning. Between the rain showers, the women lit large road flares and held them aloft, the color of the emission a light pink instead of the normal red. 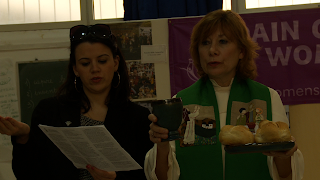 Erin Saiz Hanna, executive director of the Women’s Ordination Conference, a U.S.-based organization that has been working for the ordination of women since 1975, said she would like an official reopening of the discussion on women’s ordination.